In this review, I would like to show you all you need to know about HireWriters and give my honest opinion about it. Is it a scam or legit? Highly recommended: Learn step by step how to build an affiliate business that allows you to be your own boss and work anytime, anywhere. They only accept native English speakers. There is a risk of having your account terminated if you use a password that Company considers "insecure." Some people claim they lock accounts for no explicit reason. How Does it Work for Writers? First of all, HireWriters just accepts native speakers from The United States, The United Kingdom, Ireland, Australia, New Zealand and Canada. 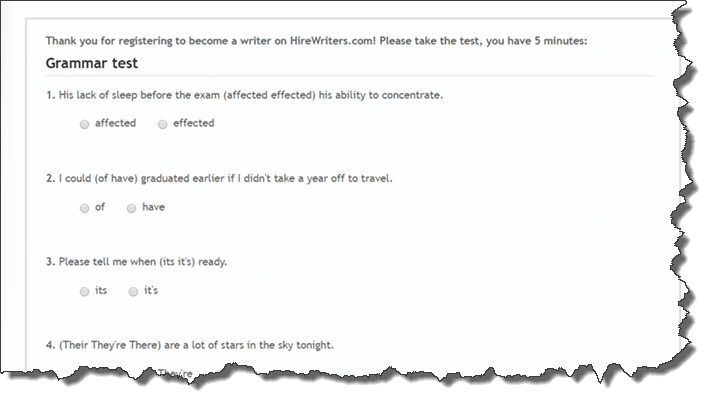 In order to join HireWriters team, you will have to sign up for free and complete a pain-free grammar test. I am not a native speaker, but I found the test very easy. If you pass the test, you will be notified by email within 48 hours, and your account will be activated. After that, you will be able to log in and start applying for gigs. HireWriters use a ranking system so that people who perform better have more job opportunities and earn more. Your earnings depend on the size of the articles as well as on your rank. 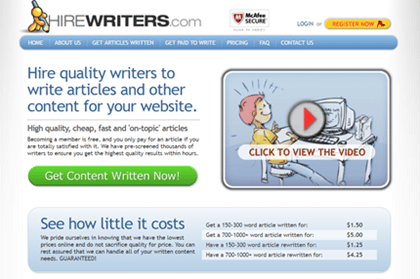 As a beginner, you can earn approximately $2.25 for a short 300-500-word article. Now, if you were an expert, you could make $10.66, which is much better, but still, you have to be a a fast writer to keep your wage at a higher level. If you are a native speaker and you are good enough to reach higher rankings, you have a good chance of making more money in other freelancing platforms. In my opinion, HireWriters can work well for people starting out as freelance writers, but the income potential is quite low. It's comparable to what writers are charging on Fiverr.com, with the difference that most freelancers over there are not native speakers. HireWriters pays automatically via Paypal every Friday as long as you have more than $10 in your balance account. What puts me off recommending HireWriters is the large amount of complaints we can find about it on the internet. Locked accounts: Some people complain HireWriters closed their accounts and blamed them for fraudulent activities. However, they are vague and don't explain which rules were violated. Low Pay Rate: In the words of one reviewer called Jim, "This site is an online sweat shop that pays writers a pathetic, pitiful amount of money to create articles." Jim read somewhere that the site is used by people who buy cheap articles and resell for a profit in another freelancing platform. Conclusion - Is HireWriters a Scam? HireWriters is not a scam as it's basically a freelancing platform that earns revenue by connecting workers with businesses/individuals willing to pay for writing services. I have to confess I a bit concerned about some complaints. However, we will never know what exactly happened with people whose accounts were locked. So, I will not point the finger at anyone without any proof. Also, I will not say you shouldn't work for HireWriters because of the low pay. Only you can decide what's best for you. But now you know the risks and the possibility of making more money as a freelancer elsewhere. The decision is all yours. Some good alternatives to HireWriters include Upwork, PeoplePerHour, SimplyHired, and Freelancer. Now, if you are just sick and tired of trading time for money and want to earn a residual income that gives you more freedom, take a look at my recommended strategy below. In 2015 I stumbled across the possibility of building an affiliate site and make a full-time income online. I was so inspired and motivated to break free from the 9-5 that I quit my master's degree and gave up on my future career just so I could become 100% dedicated to my goals. Was it the right decision? Well, I don't know. What I do know is that I am free from the student loan and I am making over $900/mo on the side with my online business. Besides, I love being my own boss and the possibility of working whenever and wherever I want. Affiliate marketing is a great way to make money online. It's not a method to reach quick results. But depending on how you go about it, you can build a reliable source of income for many many years! I learned affiliate marketing with an excellent step by step program that also gave all the tools I needed to grow my online business. This is a solid method that works for those who take action and follow through. So, if you are interested, click the green button below and read the full review of my No. 1 recommended program. Thanks for checking out my HireWriters review. If you have any questions or want to share your personal experience with it, please feel free to leave a comment below. This is the worst website both to clients and writers. If you want to be disappointed as a freelancer, work with these people. They will wake up one day, block you and take all your money. Then they will never respond to your emails. My advise: If you hear Hirewriter, RUN, RUN, RUN! Sorry you had such a bad experience with hirewriters, Elizabeth. There are reliable platforms for freelance writers such as Fiverr and Upwork. Hi Elizabeth, they froze mine too with $80 in it. They’ve been ignoring my emails for the last 2 weeks. I’ve heard it is a geographical issue. In which country are you? USA? Tired of superficial reviews. Hope that you get more subscribers and visitors. All the best. Marian in UK. My problem with Hire Writers is that they do not screen their clients very well at all. There are numerous lists of jobs that want to pay way less than what the job requires. I am sorry but I will not write an article of 500 words for $2 and some change. The clients lie all of the time about the initial description and they want to pay less. Another warning that I can not stress enough because it did happen to me is that the clients will steal your work. You can submit an article only for them to reject it and they have your work and you don’t get paid. Hire Writers may not be a scam but a lot of the clients are scammers. I wrote for them for a couple of weeks just so that I could have a few samples for my profile.